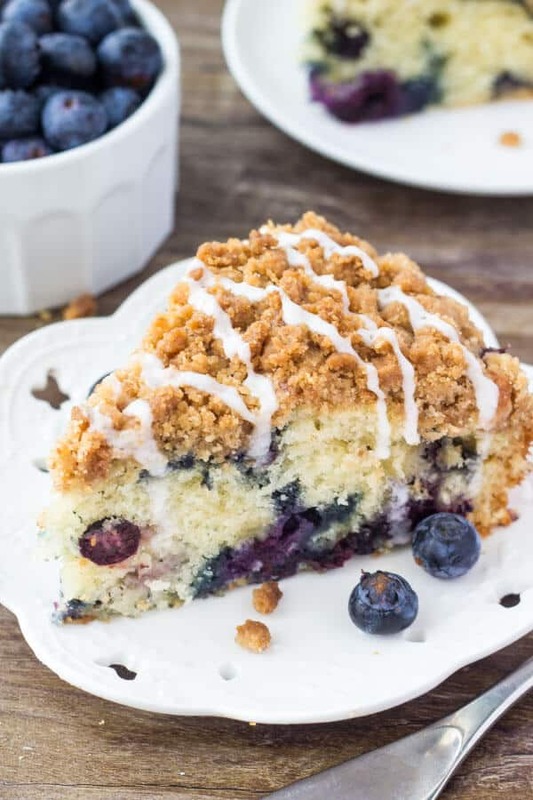 Fluffy, buttery Blueberry Coffee Cake with Streusel Topping. Bursting with fresh berries, perfectly moist & perfect for spring! 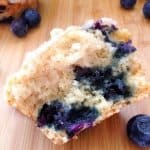 Take your blueberry muffins up a notch and make this Blueberry Coffee Cake instead. Fresh blueberries are probably my favorite fruit to bake with. Juicy, sweet, and they add so much color to just about any recipe. Whether it’s a buttery blueberry crumble bar, a blueberry topping on cheesecake, or lemon blueberry muffins – everyone needs a few good blueberry recipes in their tool belt. (Like their imaginary, fictitious kitchen tool belt of recipes… if that’s a thing). So today we’re making blueberry coffee cake with streusel topping. It’s a buttery blueberry coffee cake made with sour cream and buttermilk so it’s extra moist. Then it’s filled with juicy blueberries and topped with crunchy crumbly streusel and a drizzle of vanilla glaze. Basically, it’s your favorite blueberry muffins taken up about 10 notches. Because cake for breakfast is always a good thing. And cinnamon streusel is always a plus. The blueberry coffee cake is fluffy, buttery and perfectly moist for a few key reasons. The recipe starts with real butter for the most flavor. Then we cream together the sugar and butter for a perfectly fluffy cake crumb. 2 eggs get added for tenderness. And vanilla extract for more flavor. Then sour cream makes our cake super moist. And buttermilk gives the softest texture. Finally, make sure not to over mix the batter. Otherwise your cake can end up tough. Then once the batter is mixed, it’s time to carefully fold in the juicy blueberries. First the blueberries are tossed with a little flour to help them stick to the batter so they don’t all fall to the bottom. Then they’re gently stirred in by hand. 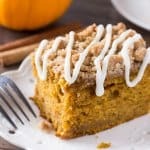 The streusel topping is buttery, crunchy, filled with brown sugar deliciousness and a hint of cinnamon. Then a drizzle of glaze for a little extra pizzaz – and we’re good to go. Fluffy, buttery coffee cake. Crunchy, cinnamon streusel. Juicy blueberries. 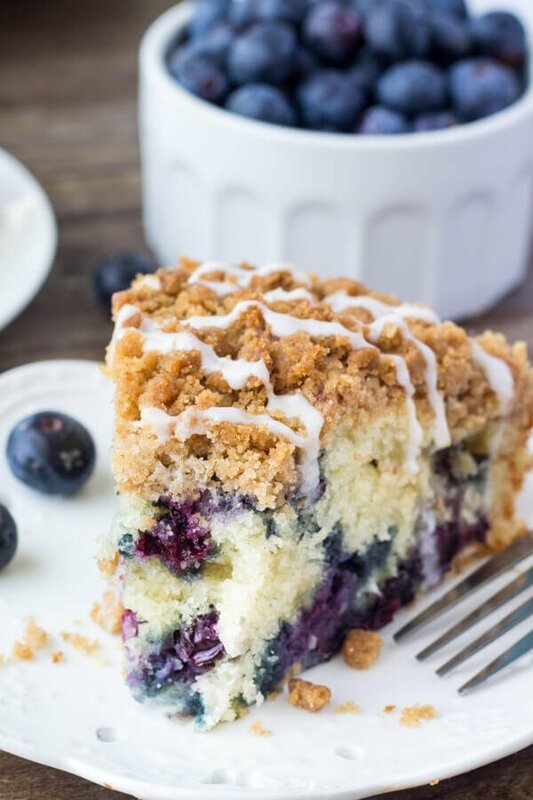 Yup – this Blueberry Coffee Cake with Streusel Topping is just that delicious. Fluffy, buttery Blueberry Coffee Cake with Streusel Topping. Bursting with fresh berries, perfectly moist & perfect for spring! In a medium-sized bowl whisk together the flour, sugars and cinnamon. Then stir in the melted butter with a spatula or spoon. The mixture should look like wet sand and crumble if you squeeze it in your palm. Set aside. Preheat the oven to 350F degrees. Grease and lightly flour the bottom and sides of a 9 inch springform pan. In a medium-sized bowl whisk together the flour, baking powder, baking soda and salt. In a separate large bowl using an electric mixer on medium speed, beat the butter and sugar together until fluffy. Then add in the eggs and vanilla and continue mixing until evenly combined. Then turn the mixer down to low speed and beat in the sour cream, followed by the flour mixture. Scrape down the sides of the bowl as necessary, then carefully beat in the buttermilk. Be careful not to overmix the batter. In a medium bowl, toss the blueberries with 2 teaspoons of flour. Then gently stir into the cake batter using a large wooden spoon or rubber spatula. Pour/ spoon the batter into the prepared pan, then crumble the streusel mixture over top. Bake in the preheated oven for 45-55 minutes or until an inserted toothpick comes out clean or with a few cake crumbs, or when you give the pan a gentle nudge the cake doesn't wobble. If you notice the top starting to get brown around 40 minutes, you can tent a piece of tin foil and place it over top. Allow to cool fully in the pan. In a small bowl, whisk together the powdered sugar and milk. Add a little extra milk or powdered sugar as needed. Once the cake is fully cool, trace around the sides of the pan with a thin knife then unclamp the springform pan. Cut into slices, and drizzle each piece with the glaze. *Ensure these ingredients are room temperature before getting started. **If you don't have buttermilk, add 1 teaspoon of distilled vinegar to 1/3 cup of milk and allow to sour for 5 minutes before using. Leftovers can be stored in an airtight container at room temperature for 2 days, or in an airtight container in the fridge for up to 4 days. Maybe its just my afternoon hunger hitting hard, but I think I could eat this for breakfast with a cup of coffee every day for the rest of my life. Dramatic? Maybe a little. Untrue? Not at all. Haha – I definitely ate it for breakfast, mid-afternoon coffee and dessert all in one day! Perfect excuse to have cake with my coffee! 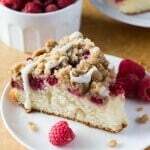 I made this recipe without the glaze and it was delicious and very moist! I only needed 2/3 of the struesel topping. Will definitely make it again! I’m so glad you enjoyed the recipe!Hope you had a great long weekend! Made this today for my quilt group – did a double batch of batter and put blueberries in one half and a layer of cinnamon/pecan struesel in the other. Both were delicious and this will be my go-to coffee cake recipe from now on. The texture of the cake was wonderful – moist and tender. A double batch of the struesel made way too much and I tossed about a third of it so will scale that back next time. Thanks for a great recipe!